Black tie optional? 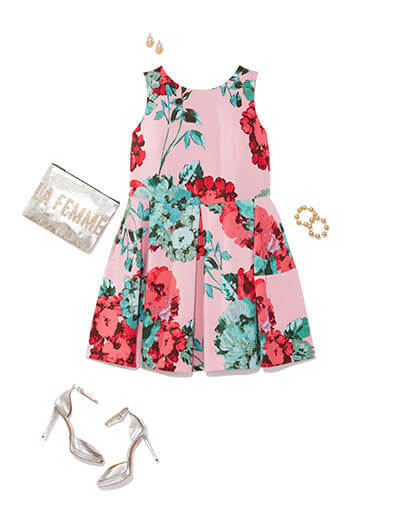 Outdoor formal? Whatever the wedding invite reads, Dia&Co has you covered. 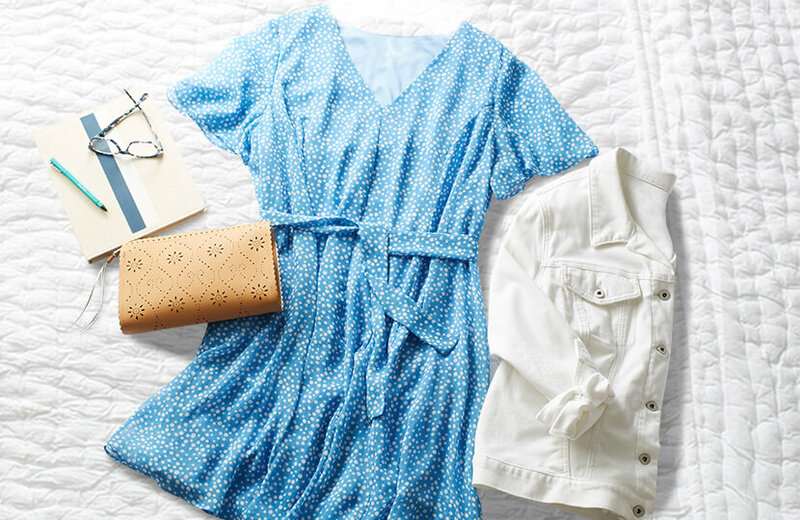 Wedding season is here—and it’s filling up our weekends and our closets with new pieces to wear for each occasion. The trickiest part? Deciding what’s appropriate to wear for each wedding, which has its own dress code, its own theme, and its own personality. We’re here to help you break down what that confusing dress code really means. Note: That tried-and-true rule that white is off-limits is a good one to adhere to regardless of the dress code! Is your calendar full of nuptials? Be sure to let your Dia Stylist know what the dress code is, as well as any other helpful details so that your next Dia Style Box can be filled with wow-worthy pieces suitable for the bride’s big day. Unless you’re lucky enough to be invited to dinner with the Queen, this is probably the most formal invite you’ll ever receive. Generally, black tie weddings take place in the evening. While you aren’t required to wear a ball gown or gloves, long evening dresses are preferred. This is an extremely confusing dress code. Do you wear black tie or to go the “optional” route with something else? It’s always a good idea to err on the side of caution and go more formal than not. Cocktail attire is allowed, so if you have the perfect cocktail dress, this might be the right time to bring it out! Also called Semi-Formal or Dressy Casual. What makes for a really fun happy hour? Cocktails! What makes for a really fun dress code? Cocktail attire! This is the best excuse to wear a bright, short, fun dress. Shoes are the most important thing to be concerned with for garden formal weddings. As the name implies, you’ll likely be standing on grass, so stay away from stilettos. Wear a print that reflects your garden surroundings like a bold floral. “Outdoor formal” weddings have the same requirements, just look for a style that reflects the location of the wedding. Like with garden weddings, the most important part of your outfit is your footwear for beach formal weddings. Stilettos will sink into the sand, so it’s best to go with sandals or wedges. 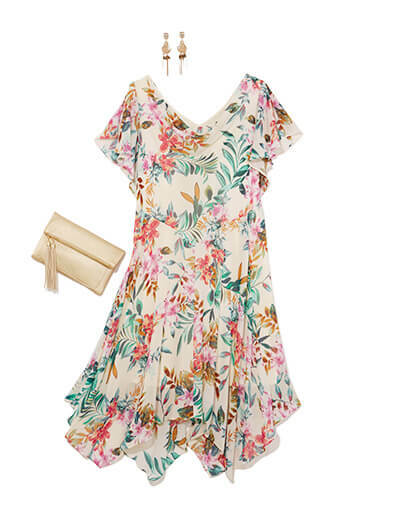 When it comes to your dress, think beachy: long and flowy. Remember that wind might be a serious factor, so the longer the dress, the better. This seems to be the newest trend in wedding dress codes (and also the least clear)! The idea behind this dress code is that the bride and groom want you to have fun with your look. Bold-colored cocktail attire, out-of-the-box accessories, and multiple statement pieces are great ideas for this theme. If you’re headed to a barn wedding or you spotted a vintage truck on the invite, lean into the theme and skip the glam dress. Steer clear of stilettos as you’ll likely be walking on grass or hay—wedges or block heels are the way to go. 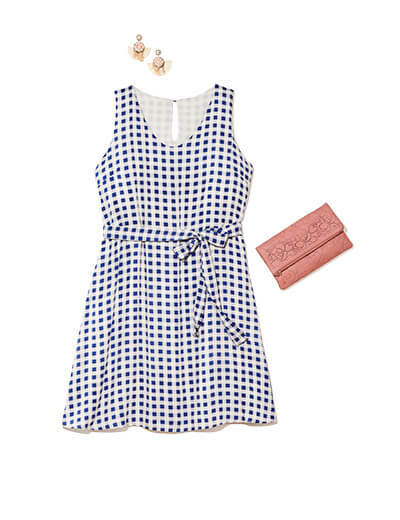 Look for cotton and playful prints that are reminiscent of farm style. Even though this dress code should put less pressure on guests, it can be tricky to be neither overdressed nor underdressed. Steer clear of Hawaiian shirts, tank tops, and denim. Sundresses are perfectly appropriate. This isn’t the occasion to stress over—you probably already have the perfect piece in your wardrobe! What kind of wedding is on your calendar? Let your Dia Stylist know so you can be sure to get the perfect pieces in your next Dia Style Box. Need a box full of dresses just for the occasion? Request one now so you can be sure you find the right outfit for this romantic occasion. And don’t forget to snap some photos and use hashtag #MyDiaStyle so we can celebrate how fabulous you look even though other attendees’ eyes will be on the bride.